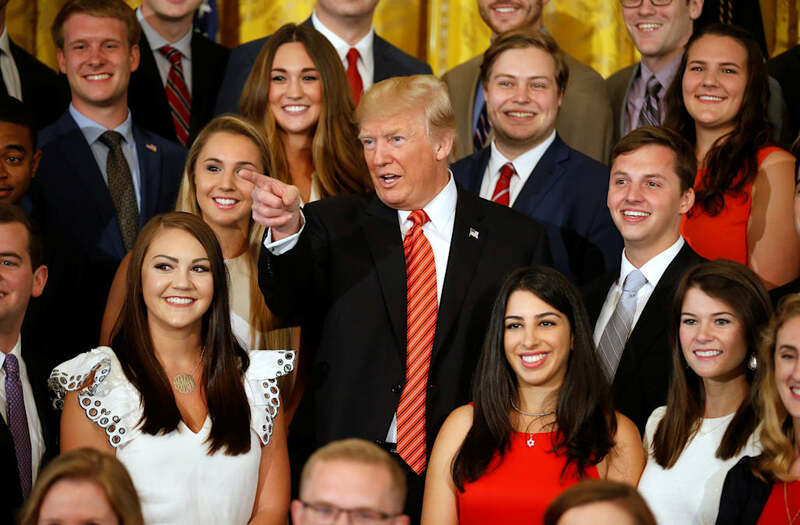 President Donald Trump rolled his eyes and told a reporter to "be quiet" when she asked him questions about Attorney General Jeff Sessions and the Republican healthcare bill during a photo shoot with White House interns on Monday. As photographers snapped away at the group of interns gathered around Trump in the East Room of the White House, Catherine Lucey, an Associated Press reporter, called out, "Mr. President, should Jeff Sessions resign?" Trump's smile immediately disappeared and laughter broke out among the interns. The president then rolled his eyes before Lucey followed up with, "Do you have a message on health care?" The president then commanded Lucey to "be quiet," which threw the interns into another round of laughter. "You see, they're not supposed to do that," Trump said. "But they do it, but they're not supposed to." He went on, "She's breaking a code back there. But they don't care. They don't care about breaking codes." Just a few hours before the photo-op, Trump called Sessions "beleaguered" in a tweet asking why his attorney general and Congress aren't investigating "Crooked Hillarys crimes & Russia relations." In a remarkable admission during an interview with The New York Times last week, Trump said he would not have chosen Sessions to be attorney general had he known Sessions would recuse himself from the ongoing investigation into connections between Trump's campaign and Russia. In another tweet on Monday morning, Trump put pressure on Republican lawmakers to repeal and replace Obamacare, a campaign promise he implied they would break if they failed to do so. "Republicans have a last chance to do the right thing on Repeal & Replace after years of talking & campaigning on it," he wrote.